De Vere’s Irish Pub, Davis. Click to see bigger. 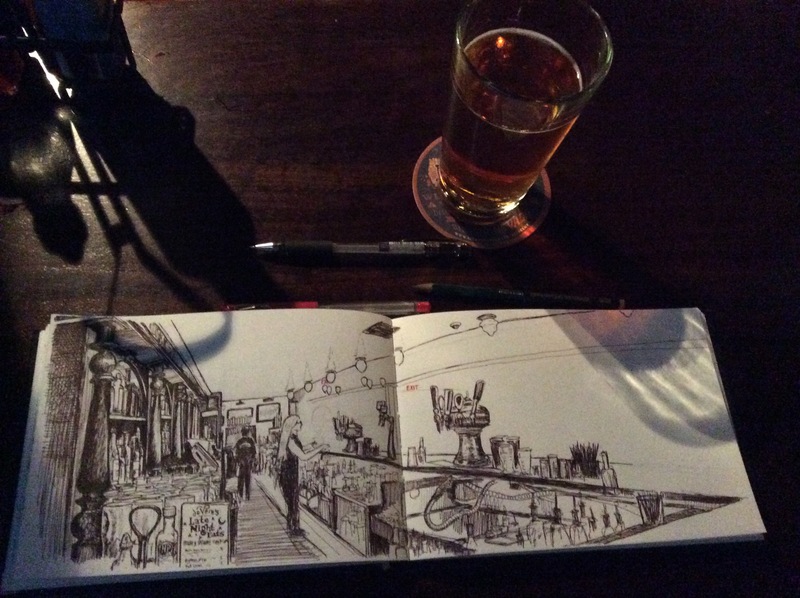 On the last day of January (this is how long it’s taking me to find a few minutes to scan sketches in these days…) I decided I needed to add to my bar panorama sketch series, and went down to De Vere’s Irish Pub in downtown Davis to practice from a different angle. I sat in that corner at the end of the bar, nicely tucked out of the way, and sketched the evening away. Andy Murray was on the TV above me, losing in the Australian Open final, and the place was pretty busy. I started on the left with the close angle of behind the bar itself, making sure I sketched the ‘Late Night Eats’ menu before it got moved. 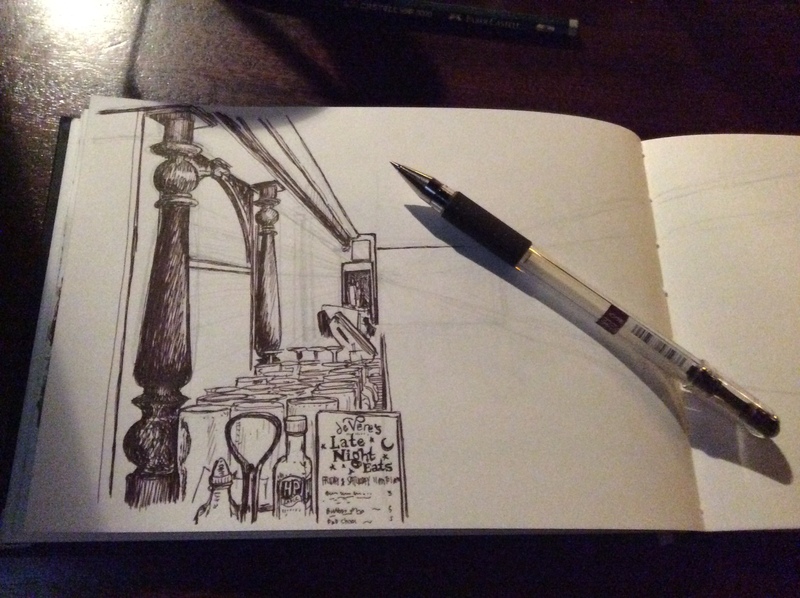 It’s good to have something like that if you are sketching a bar, as it places you in both time and space. There’s a little tip. For the budding bar-sketcher, here are some in-progress photos; I used a brown-black uni-ball signo um-151 pen size 0.38 (the best), in a Seawhite of Brighton sketchbook (not the best, but not bad). Next I sketched the bar itself. I used a few pencil lines to try and figure out the perspective lines, but it’s not scientifically exact, more of an ‘as good as’. The thing about perspective is that your direct moves about a lot and so you usually have several perspectives going at once. I added a couple of the barstaff; whenever I sketch bars I often leave them out because, to be fair, they move around a lot. It helps to include them however, to break up the repetition of a long stretch. Plus it’s always good when sketching people working to show them hard at work. I sketched the behind-bar are and the taps next, and those little black straw things that appear in almost every bar sketch in the history of the world, for some reason. You can see how the bar angles towards me at the far right corner, but I didn’t have room to show my part of the bar. And here’s the finished sketch. By this point I had had about four pints ($3 pints of Sudwerk Dry Hop Lager if you must know), and had included the throngs of people at the bar. People are generally generic, but look kinda like the real people that were there. There was a man wearing one of those triangular/conical hats, looking as though he worked in a paddy field (no jokes about paddy fields and Irish pubs please), so I drew him twice. Although I left drawing the people to last, this actually opens up into being the focus of the bar, with the elongated triangular space in which they are positioned becoming wider and more interesting as the eye is drawn rightwards. There, see if you can talk about panoramic composition after four pints of beer. To be fair if someone had asked me (and I think they may have done) my answers would have been nonsense; to be fair, they are nonsense even before four pints of beer. I’m happy with the results though, and I decided not to add paint, so you can feel it in all its hastily scratched-in glory. 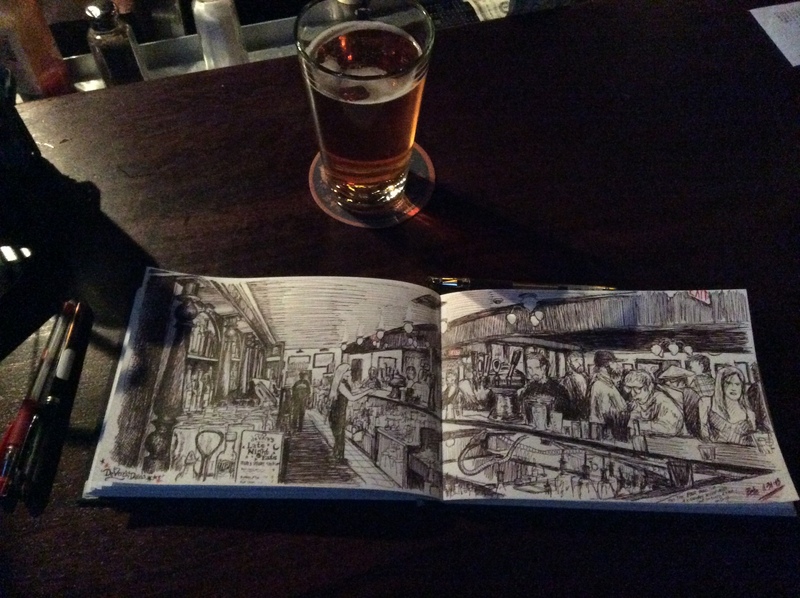 De Vere’s is a good pub to draw panoramas of. Cheers! Sketcher I found by trawling the Internet, finding the magic pin the every day. Great sketch! I love the strong perspective lines. They add a real punch to the composition. When are you coming to Portland again? I want to draw some panoramas with you over some pints. It would be so much fun. Hi Rita, hopefully this year for sure! I didn’t make it up in 2014 so I am due a trip. I’ve been really enjoying your sketches lately, especially the panoramas, you’ve been an inspiration. I’ll let you know when I next plan a trip, would love to sketch with you. Fascinating work! (Hope that my wife didn’t see me in there:-).